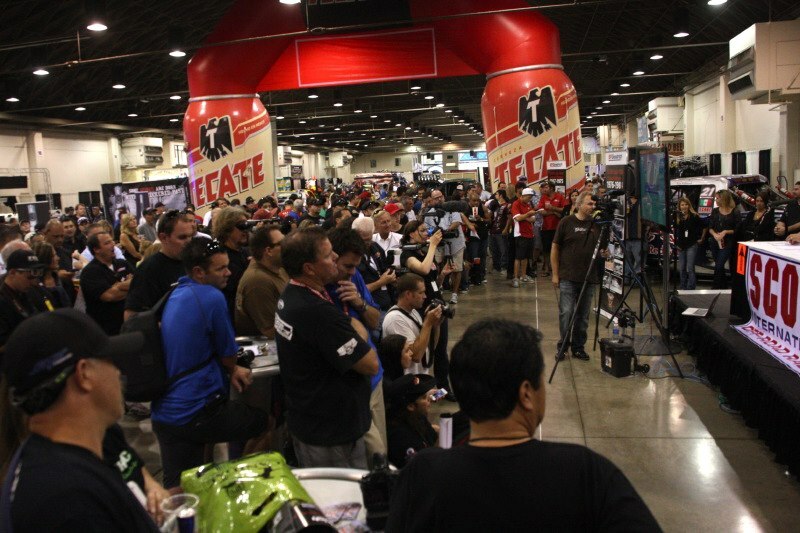 POMONA, Calif. (September 11, 2013) – Celebrating all that is off-road, 2013 Lucas Oil Off-Road Expo powered by General Tire will host the Tecate SCORE Baja 1000 Desert Race official live race drawing for starting positions. On Saturday, October 5, at 3 p.m., the crowds will flock to the expansive SCOREville exhibit in the Pomona Fairplex Building 5, to hear the live announcements and be among the first to see the official race course map. Set to take place Wednesday, November 13, to Sunday, November 17, 2013, this legendary Baja off-road race will cover much of Mexico’s Majestic Baja California Norte region of the peninsula with a loop course that will start and finish in Ensenada, Baja California. More than 300 entries of cars, trucks, motorcycles and ATV’s will fill 40 pro and seven sportsman classes. All weekend long, off-road fans are invited to visit the SCOREville exhibit, a tribute to SCORE Baja racing legends, to see vintage and current desert racing vehicles, along with autograph sessions with many of the stars of the sport, both past and present. This off-road mecca will also host the debut of the 46th Annual Tecate SCORE Baja 1000 official commemorative merchandise, live internet coverage on Dirt LiveHD, Monster Energy Girls and large screen showings of race videos including the iconic 2004 film “Dusty to Glory”. For additional information, visit www.score-international.com. On Saturday, October 5 and Sunday October 6, from 12 p.m. – 2 p.m., SCOREville will be buzzing with a slew of autograph sessions with many of the top desert racers from today and yesterday. Industry giants Roger Norman, Sal Fish, Ivan Stewart, Larry Roeseler, Rod Hall, Rob MacCachren, Walker Evans, Justin Davis, B.J. Baldwin, Ronny Wilson, John Langley, Andrew Myers, Ryan Arciero, and more are expected to be on site to greet fans, sign autographs and pose for photographs. The 2013 Lucas Oil Off-Road Expo powered by General Tire will showcase with everything off-road including new vehicles, thousands of parts and accessories, Toyota off-road test drives, racing demos from the King of the Hammers and Lucas Oil Off Road Racing Series and more on Saturday, October 5, from 9 a.m. to 6 p.m. and Sunday, October 6, from 9 a.m. to 5 p.m. The Expo will take place at the Pomona Fairplex, located at 1101 W. McKinley Avenue in Pomona, Calif. Advance discount tickets are available at www.OffRoadExpo.com for $10 adults and $5 children (ages 6-12). Kids 5 and under are free. Tickets may also be purchased on-site for $14 adults, $5 children. A Family Four Pack is available for $22 and includes admission for two adults, and two children (available online only through Friday, October 4). For more information, visitwww.OffRoadExpo.com. Follow the Lucas Oil Off-Road Expo at www.facebook.com/OffRoadExpo and atwww.twitter.com/OffRoadExpo.